Slightly edited version of article originally published under the title "Fine, then ... India, Japan and Israel in the UNSC?" Tragically, and in his own words, Turkish President Recep Tayyip Erdoğan thinks (or pretends to think) that the primary reason behind terror in Turkey is to prevent Turkey from getting into the world's top 10 economies. "We very clearly see that it does not suit some people's interests for Turkey to become one of the top 10 economies in the world ... And they try to steer Turkey away from its goal through the scourge of terror." Erdoğan bemoans that 'there is no Muslim country among the five' permanent members of the UN Security Council. If not five, what does the world equal, then, in Mr. Erdoğan's thinking? 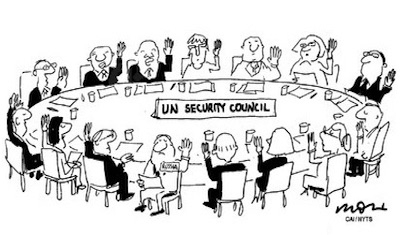 All 193 U.N. member nations as permanent members of the Security Council, all with veto powers? That would not be practical. One country representing each monotheistic faith? Is Mr. Erdoğan implying that he wants Israel as a permanent member? Another criterion could be to nominate the most populous Muslim country in the world. That would point to Indonesia and even Pakistan and Egypt would come before Turkey. Indeed, India, where according to the 2011 population census the Muslim population is twice as big as that of Turkey, would be a far better candidate than the Crescent and Star. Mr. Erdoğan complains that all five permanent members are Christian but since in the new "faith-based setting" there will be Sunni and Shiite members, what if the Christians want representation on the grounds of Catholic, Orthodox, and Protestant (and other) faiths? What about the animists in Africa? Or Zoroastrians – for whom Mr. Erdoğan has never hidden his deep disdain? And, by the way, are we talking about a security council or a world congress of the faithful including those with faith in no faith?